A campaign also calls forth well-founded worries, such as the perception that the annual fund will suffer. Since the most common early donors to a campaign are those who already make annual gifts, Campbell & Company decided to explore the conventional wisdom that campaigns cannibalize annual giving. Over four decades of providing campaign counsel to nonprofits across the country, our firm has gathered strong anecdotal evidence that campaigns do just the opposite. In our experience, campaigns have the ability to transform programs, development departments, and entire organizations and have a positive impact on annual giving well beyond the campaign’s conclusion. 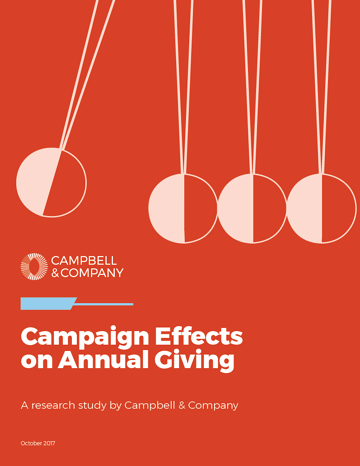 Through this research initiative, Campbell & Company sought to identify the true impact campaigns have on annual giving, both during and after a campaign. Download our study to review our original research and best practice recommendations. Campbell & Company is committed to helping nonprofits thrive before, during and after their fundraising campaigns. For additional insight on this topic, watch our webinar and don’t hesitate to contact me with questions. Dan Pronovost is a Consultant at Campbell & Company. Dan approaches each client engagement with active listening, effective communication, attention to detail, and strategic thinking.